A few years ago when I got into canning the thing that really frosted me was that so many jam recipes include more sugar than berries. The fruit that I can is organic, picked by me at the perfection of ripeness and I want to taste the fruit; only. 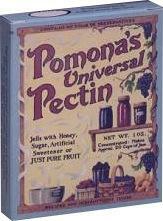 After some research I learned about Pomona’s Universal Pectin. This may end up smacking of an infomercial but it was life changing for me in a canning way. This pectin (the substance that causes the jam to gel) provides you can use honey as a sweetener or far less sugar than any other pectins (as well as other sugar substitutes) I’ve found. I was hooked. I’ve made many jams and jellies with this pectin using minimal honey with great success. It DOES taste like the fruit only. 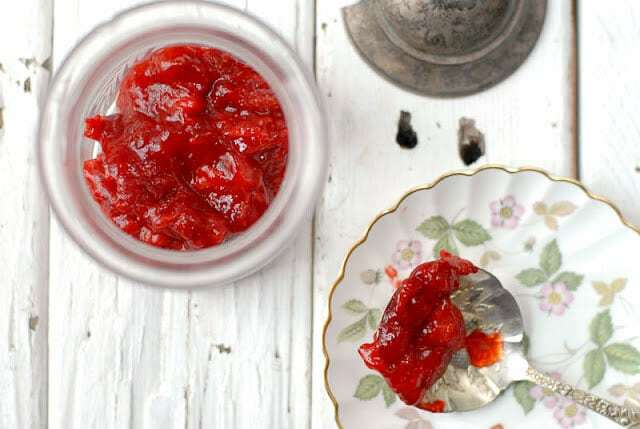 There have been some cases, making a jam of wild Raspberries and wild Rhubarb for instance, where sugar was the right taste for the jam and I’ve used the minimal recommended amount with no heavy sugar taste. I did make a batch of strawberry jam using honey last year. Though it was delicious, the pallor of the jam was very gray, challenging the eye when eating it. Sugar does act to preserve the color better and that played out with this batch beautifully. If you have not done canning, this is a very easy place to start. Being a complete botulism phobe I will tell you cleanliness and sanitation are critical in canning. It’s very easy (and quick in this case) but you must pay attention to your process. I will share the canning direction for this jam as well as will say you can eat it without canning it (I’d recommend after putting the fruit in hot jars, sealing and letting them cool before refrigerating). If you choose not to can it, I’d recommend keeping it in your refrigerator and eating it within a few weeks time. If you can the jam, it can remain on the pantry shelf unrefrigerated for up to a year (though I’ve kept mine at times closer to two years with no issues) and should be refrigerated after opening and eaten within two to three weeks. 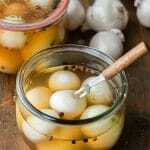 Always inspect stored canned goods when opening for a good seal, any growth inside the jar or odd smell. Discard in any of these cases. I have not ever had any of these occur personally. 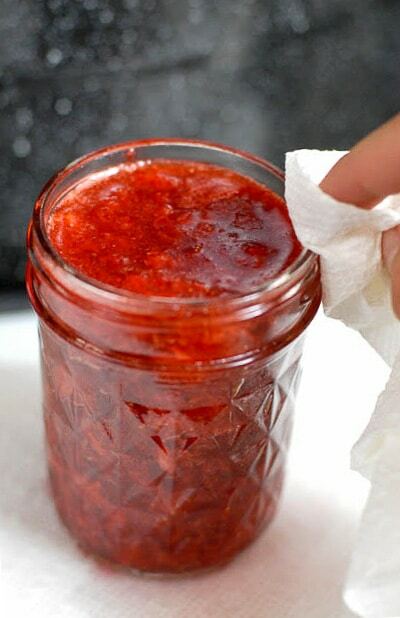 On my way out the door this morning I slathered some of this beautiful jam on a roll. 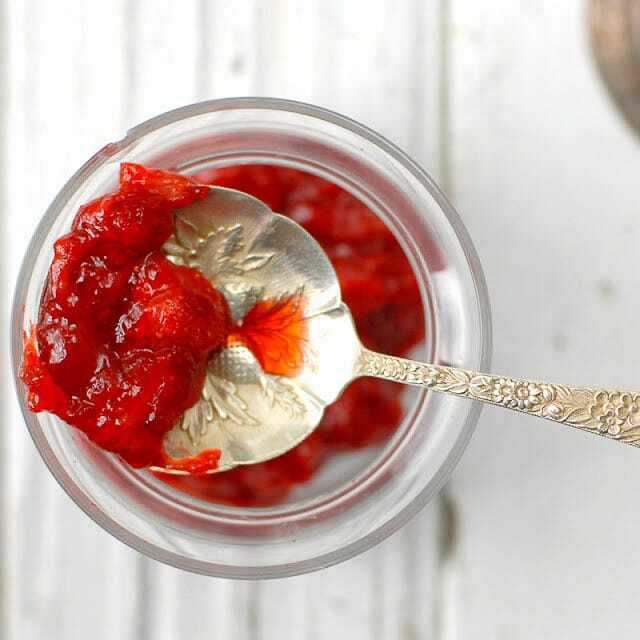 There is nothing happier to greet you in the morning that this ruby red, luscious jam that tastes quintessentially of summer. I wanted to also share my favorite canning tools. They are readily available where any canning supplies are sold. For a very small cost, they make the task a breeze. You can see them in the photos above. 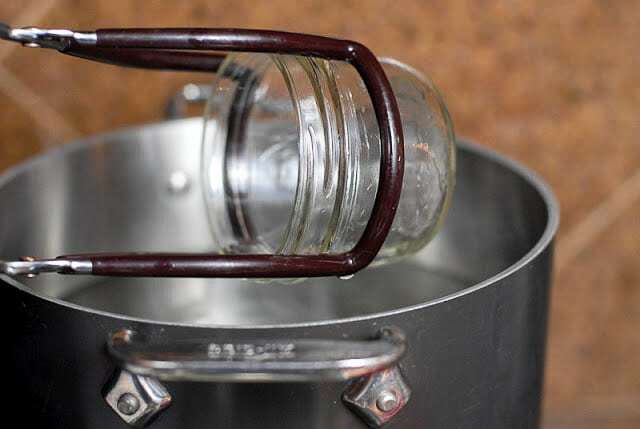 Jar Lifter: Use it for lifting jars easily in and out of hot water. 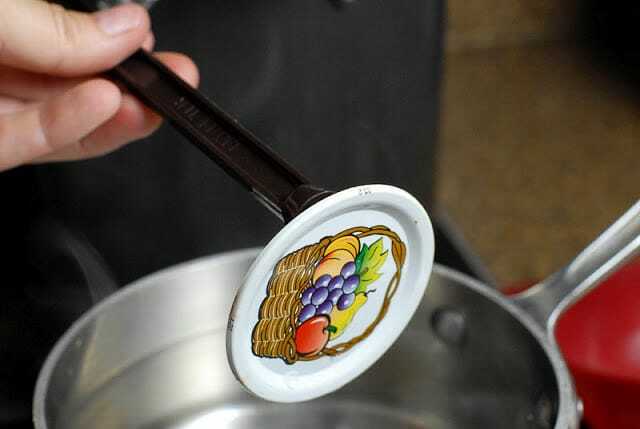 Magnetic Lid Grabber: Use to get the lids and rings out of hot water. 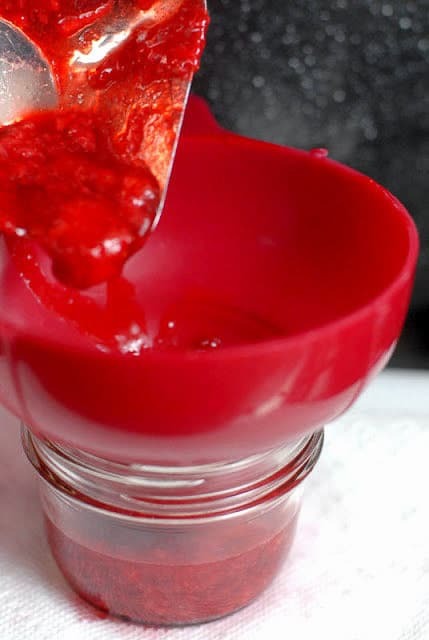 Canning Funnel: Make quick work and less mess of getting the jam into the jar. Ironically after completing this post when retrieving the Pomona’s Universal Pectin website address, I note this video on their home page making this same recipe. It tracks what I do very closely showing the simplicity of the process. 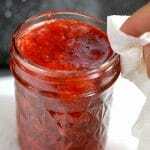 Pomona’s Pectin “How to Make Low-Sugar Strawberry Jam” from Pomona Pectin on Vimeo. Since I made this jam using Pomona’s Universal Pectin I am replicating their instructions for the jam. The pectin is available at many stores and can also be purchased from online. The recipe insert in the pectin box allows for a variety of sweeteners like Splenda, fructose, xylitol as well. Using sugar also preserves color so when making jam with alternative sweeteners the berry color may not be as brillian in hue. 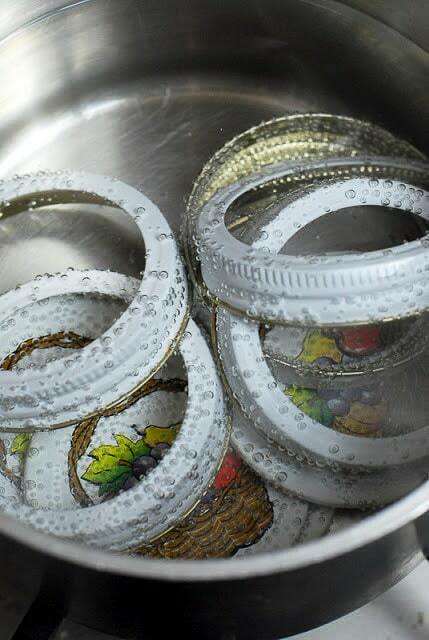 If canning, begin to heat water canner, pans with cleaned jars and lids and rings. I do this in three pans. The water canner takes longest to boil due to water volume and I like that to be close to a boil then starting to cook the fruit. The pan with rings and lids does not need to boil but be just under a boil. The pan with the jars should boil and be kept in hot water until filled. 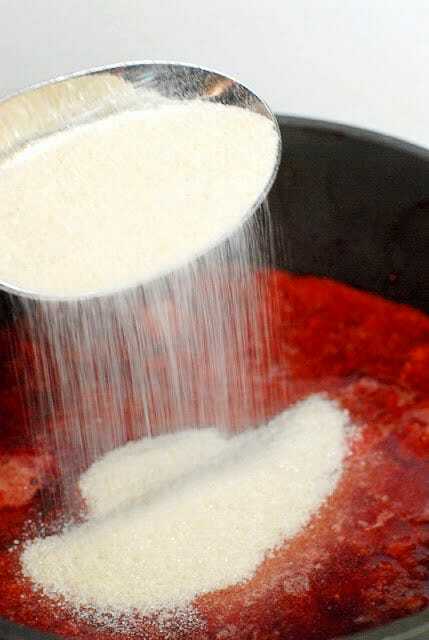 Add strawberries to a large pan. I mash mine with a potato masher in the pan having hulled and de-stemmed them already. Add the calcium water and stir to combine. In a separate bowl combine the sugar and pectin. *Note on sugar amount: I prefer to use the absolute minimum. This recipe can use up to 2 cups of sugar. 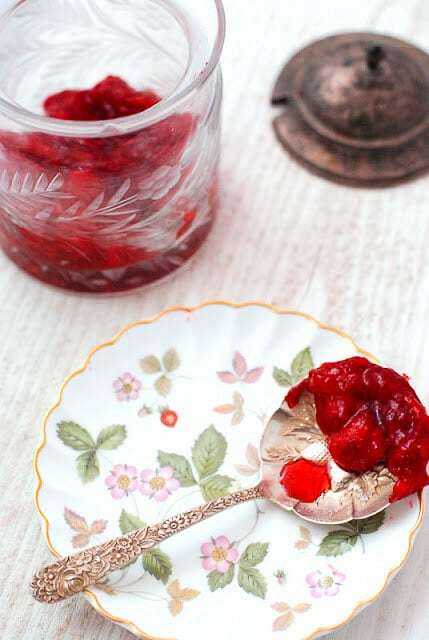 If you enjoy a sweeter jam or have berries that might not be fully sweet, feel free to add more to suit your taste. I’d recommend beginning with the specified amount (3/4 cups), taste and add more if you like to suit your taste. If desiring to use honey: use ½ to 1 cup. Bring the strawberries to a boil. Add the sugar-pectin mixture and stir constantly for 2 minutes to dissolve. 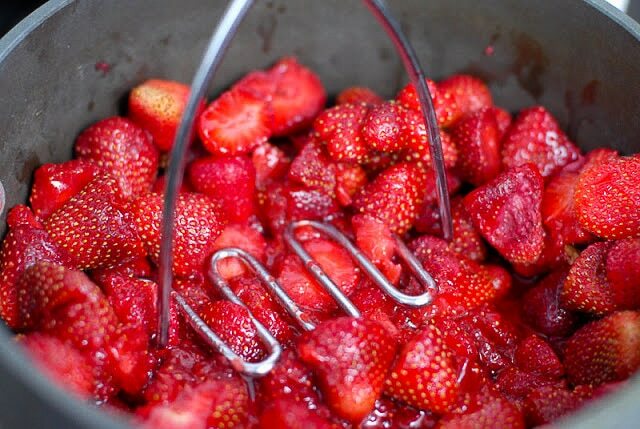 Allow strawberries to return to a boil (they will almost instantly) and remove from heat. The jelling will occur when the jam is cooled. 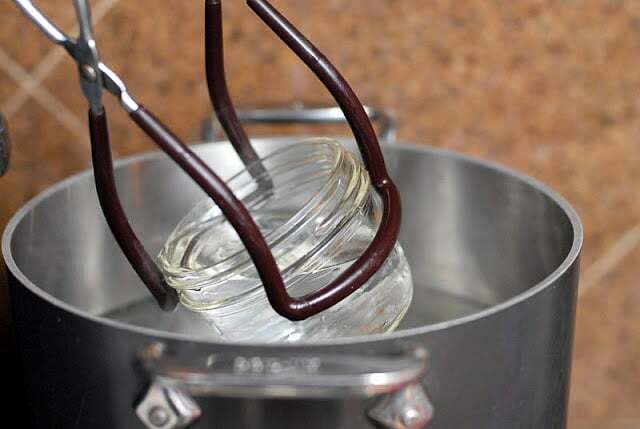 Remove jars from hot water. 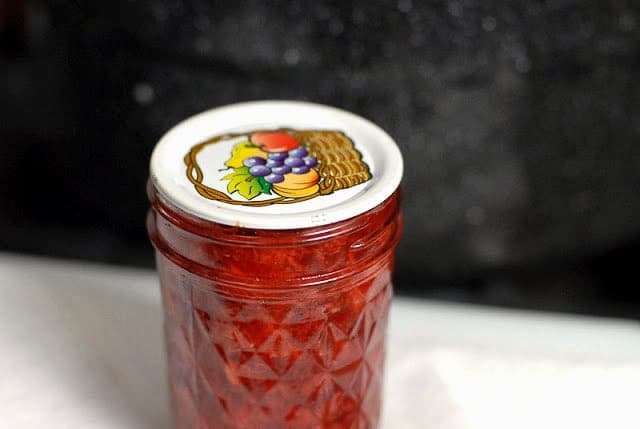 Fill leaving ¼ inch head space (the room at the top between the fruit and top of the jar required for a good seal when canning). Wipe the top of the jar to ensure nothing between the lid and the jar for a good seal. Add the ring to secure the lid. Do not over tighten the ring. 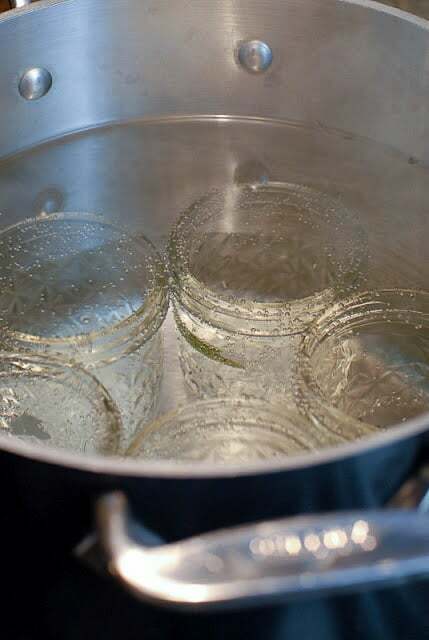 Place jars in a water canner with at least an inch of water above the top of the jars. Process for 10 minutes adding 1 minute per every 1,000 over sea level. I process mine in Boulder for 15 minutes. 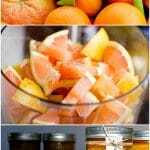 Remove jars onto a cooling rack. Cover with a kitchen towel and leave undisturbed for 24 hours. Test the seal by pressing on the center of the lid which should be sucked in. You will hear a ‘pop’ when the seal happens after removing from the water canner. Don’t worry if you miss it just check to ensure it has happened as the jars cool. I’m so glad Janet. That exact same thing that drove me to find a different jam-making solution! 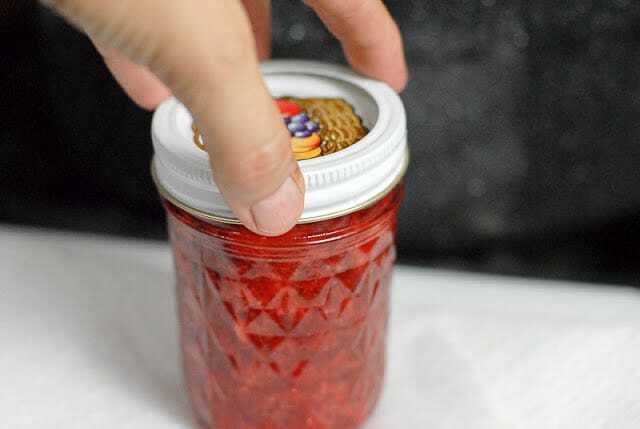 to make delightful jam. lovely!! Ppmona Universal Pectin IS NOT Organic. It is natural but not OG There is no Organically made pectin on the market to date. If you want to insure that all of your ingredients are Organic you would have to make your own pectin from organic fruit. Thank you so much Kelly for that insight! I need to learn how to can and voila here I find a great tutorial. Thanks for this. Canning scares me. Not sure why. Agreed: I want my jams to have more fruit flavor than added sugar. Great pictures! YUM! I would love a jar to come my way 🙂 Seriously you should do a give away. I just finished canning some peaches, if you get a chance check it out on my blog. Beautiful!!! And THANK YOU for passing along that information about the pectin. I am not a fan of adding anything to fruit when canning… this will make that much more achievable! I love to make my own jam too because of the very same things you mentioned. Way too much sugar in regular jams. Good to know about the pectin, Berry Patch Farm is a bit far for me, anywhere I can find it closer to Broomfield? Beautiful pictures. what a great step by step walk thru, I think I might even be able to do it!! 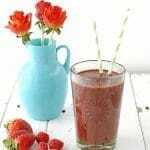 Now your jam must have just been perfect, the fresh taste of berries without all the sugar! …oh and I love your antique silver jelly spoon! I love your low sugar jam recipe! I agree…I can't stand an overly sweet jam. I must admit, I've never canned jam before. When our Florida strawberries are in season, (winter months) I'm so busy working. During my slow summer months, there isn't a fresh strawberry around town. Perhaps this summer when we go up to northern Michigan, the berries will be ready to pick there and I can try your recipe!! I want to be that girl! I've not canned much for a number of years but you hit on the one thing I never liked…how overly sweet it seemed everything turned out. I'm nudging towards doing some more on a very limited scale and this is great information Toni; fresh picked berries don't need a bunch of sugar to be amazing…why should jam? I've got ten blueberry bushes that I need to make something new with . . . we've been eating them everyday unadorned(and wonderful) but I'm wondering if blueberry jam is something I should try. This sounds so delicious and fresh. I bet using the organic strawberries makes a huge difference in flavor. 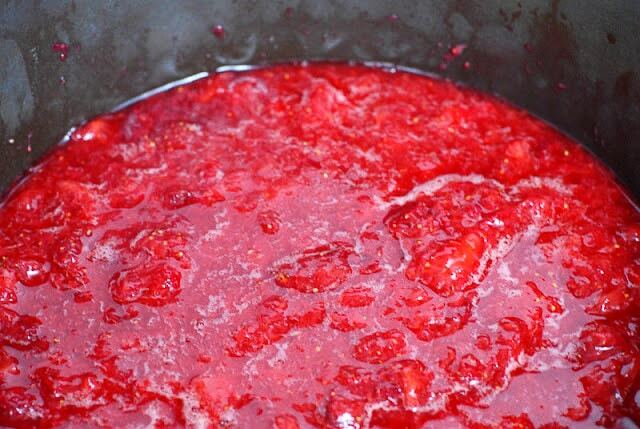 Beautiful colour on that luscious looking jam! Sounds like a perfect brekkie! I just opened a jar of last year's saskatoon berry jam….perfection! Yum! I recently made homemade Jam with fresh cherries and it tastes so much better than store bought ones. Who doesn't love a good jam. Your pictures are lovely.